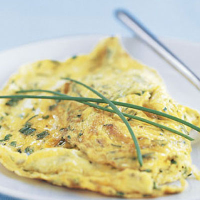 This classic omelette is made from whole eggs and is great for a light lunch or supper. The secret of a perfect omelette is to draw the mixture gently towards the centre of the pan, and to remove it from the heat before it has set completely. Break the eggs into a small mixing bowl and add the herbs. Season and lightly beat with a fork. Place a frying pan with a 15cm base over a medium heat and swirl the butter around the pan. Turn the heat to high and, when the butter begins to foam, add the eggs. When the outside edge begins to set, use a spoon or spatula to draw the mixture into the centre of the omelette, allowing the liquid egg to run into the gaps. Do this for 1-1½ minutes, or until the edge is set and the middle almost set, as it will carry on cooking when taken away from the heat. Use a spatula to fold the omelette in half and slide onto a plate. Garnish with chives and serve immediately.